There are two people in Dayton who have my respect right now. Brian Higgins over at the Sidebar in the Oregon District and John Drake of Drake’s Gym. Both have decided to color outside the lines and create their dreams in Dayton- without asking permission first. Tonight- John Drake closed off the worthless section of Fourth Street between Patterson and St. Clair and threw a boxing match up in the middle of the street- and said “come one, come all, we’re having a party and you’re invited.” I’d say close to 2,000 people showed up and watched the bouts under the lights- and had a good time. No alcohol, no slutty strippers in bikinis- he had ring kids walking the cards, and the people came downtown and joined in his party.Fight Night was a huge success. The city did provide some police, a firetruck- and a few barricades- but, what we had going on was economic development by a party of one. For one night, people were downtown- buying food from the food cart, t-shirts from the Gym, and later- heading over to the Oregon District. There isn’t any reason this kind of thing can’t be happening all over the city- making it a fun place to live, instead of the “economically developed creative class high tech” mecca they keep aiming for. Over on Fifth Street you have another former paratrooper, Brian Higgins mixing up exotic drinks along with small plate meals at the Sidebar and attracting the most diverse audience in Dayton- night after night. We sat last on the sidewalk patio last night and I watched the master at work. Calling people by name as they walked by, inviting them in, buying drinks and food for his regulars and sharing his idea of what a nightclub in a big city is supposed to feel like. It’s making the Pacchia grand opening–way back 12 or so years ago–look like a junior high dance, compared to Studio 54 in its prime- and Pacchia was considered the most successful independent restaurant launch in town. What makes this stuff work? What’s the magic mojo that’s creeping into downtown slowly? I think it’s that both men have a passion about what they are doing- and an attitude of gratitude. They want to share their passion with the people- and they don’t loathe Dayton. Where others are always seeing what we need to fix- they see what we need to do- and are doing it. Empty houses aren’t a liability- they are an opportunity. Empty produce company turns into low budget boxing gym. Restaurant that’s hit the skids- gets an instant makeover and is now pulling in the stacks of cash. Dayton isn’t dead in either of these men’s eyes- or hearts, and that’s what makes them stand out. It doesn’t take a master plan, with community input. It doesn’t take a ton of money. It just takes passion and coloring outside the lines that the man keeps telling us are there for our own good. So, if you want to get in shape, or you want to have a good time- go see John or Brian- and thank them and support them for doing what they’re doing. I will be. Yes! That was a cool thing! I passed by as they were setting up this afternoon! Had no idea what it was till cruising Facebook a little while ago! Very cool indeed! Anyone that says there is nothing happening in Dayton is not looking . Leave the malls and The Greene for a minute and find out what’s going on in the city. In addition the Blue Angels Crew was at the Marriott and they were entertained by Funky G and the Groove Machine which left a positive impression of Dayton, based on my observations and discussions with those not of the area! Great night for Dayton! There isn’t any reason this kind of thing can’t be happening all over the city- making it a fun place to live, instead of the “economically developed creative class high tech” mecca they keep aiming for. …you cannot predict the outcome of human development; all you can do, like a farmer, is create the conditions under which they will begin to flourish. I had the fortune of watching Fight Night from St. Clair Lofts – and it was truly a beautiful thing, seeing so many people come together for a free, FUN event. John had a great card put together, from middle-school girls learning the sport PROPERLY, to the main heavyweight event (not as exciting as some of the welterweight bouts, but great, anyway). John Drake has continually found ways to promote and build his business – his boxing classes are wonderful, a true “destination spot” for downtown. 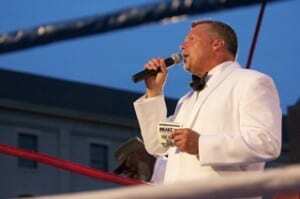 Kudos also to Tom Archdeacon and Mike Elsass for working with John to make Mr. Drake’s dream of holding a fight night under the stars a reality. David E, thanks for highlighting stuff like this. Anyone who has been Brian Higgins’ friend for any amount of time is not surprised by his success at Sidebar. Along with his other business entities, Brian always thinks outside of the box and will only settle for perfection. Visitors from outside of Dayton have patronized Sidebar and walk away amazed at the atmosphere, food and beverage selections. Dayton was made great by Renaissance men like Brian. His passion and those others who love this town will once again make Dayton the “Gem City”. Well, leave it to David Esrati to pick on and exclude yet another inoffensive minority. We’ll have you know, dear David, that slutty strippers in bikinis enjoy a night out as much as their more chaste and appropriately dressed sisters. Furthermore, many view discrimination against slutty strippers in bikinis not a matter of choice, but a serious violation of equal access laws. And how, dear David, do you know your night out would not have been enhanced had their been one, nay, 10, no 100 slutty strippers in bikinis bumping their trumpets down East Fifth Street that evening? The bias against slutty strippers in bikinis must end now. And the Old Bandito says this not just as the national spokesman for the Slutty Strippers in Bikinis Anti-Defamation League, but also as the organization’s founder….. I second that, Brian is a gem!